I have been working in fast food for nearly thirty years. My parents raised me to believe in an honest day's work. I wake up every day and go into work, ready to be on my feet, greet customers, work quickly and do what needs to be done. It's not glamorous or easy but I love dealing with people. Currently I work at KFC in Richmond, Virginia. I've been at KFC for the past nine years. Even after what feels like a lifetime of working in fast food, I still make less than $9 an hour. At 45 years old I'm still running and sweating just to survive. Recently I was forced to move into a two bedroom house that I have to share with my two sons and my daughter, simply because I can't afford anything larger. I am gearing up to start a second job, but even that won't be enough. I haven't been able to save for my daughter's college education and I am constantly putting basic items on layaway. As I'm aging my medical needs are increasing but I can't afford adequate health care. It pains me to see my family struggling the way that we do. I believe that companies like McDonalds and KFC that make billions of dollars off of our sweat, our labor, should be able to compensate us fairly. Millions of workers like me shouldn't be slowly dying to cover our basic needs. A little over two years ago, I felt as though my prayers were finally answered. I saw on the news fast food workers like me, working mothers and fathers, out on the streets in New York City, demanding $15 an hour, saying they didn't want to continue to work hard and have nothing to show for it. I was inspired. When the movement spread down South, I knew I wanted to join. After decades of being told that my work, and my voice didn't matter, I saw a movement that told a different story. I've never been someone who breaks the rules or causes conflict but I do believe in justice. The first time I went on strike it was very exciting. I remember going outside a fast food store before sunrise with all of the other workers on strike and feeling more empowered than I had ever felt before. I felt like we were on the right side of history, the way folks in the Civil Rights Movement must have felt. I felt peace finally being able to say what I had wanted to say; speaking to the pain I have felt working for low pay for so long. More than anything I felt heard, and being heard is a very important thing. Making $15 an hour doesn't mean my family would be rich, it means the peace of mind of paying my bills on time and being able to buy food when I need to. I want to be able to send my daughter to college. I want her to achieve everything she wants in life, that's why I'm fighting for $15 an hour. I want my children, all children in this country, to have a future. Every time I've gone on strike, people have asked me if I am afraid, afraid of retaliation or afraid of failing. I say the same thing each time: I am too tired to be afraid. After a lifetime of working hard, I refuse to give up hope. I still believe in the American Dream. I still have a dream of owning my own home and even opening my own restaurant. I dream of a life where I don't have to struggle every single week, to cover basic things like food, clothing, and house hold items. The Fight for $15 is growing and people are paying attention. Who would have thought that a couple hundred fast food workers in New York would turn into one of the largest worker movements in history? Now even candidates running for President must answer to underpaid workers. I believe that with our organizing we will continue to move forward, and I plan to keep fighting until we can move the nation to a place where our dreams are made possible. 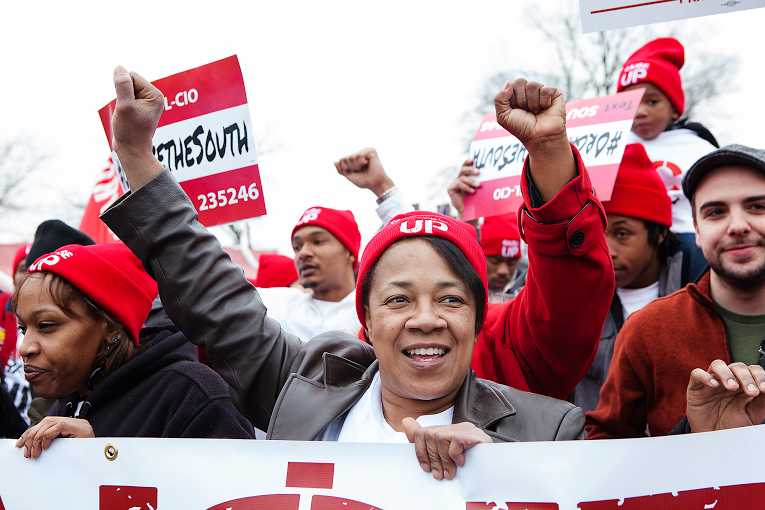 --Leah Taylor is a mother and worker leader in the Fight for $15 Movement in Richmond, Virginia. She's been a fast food worker for nearly 30 years. Currently she works at KFC. 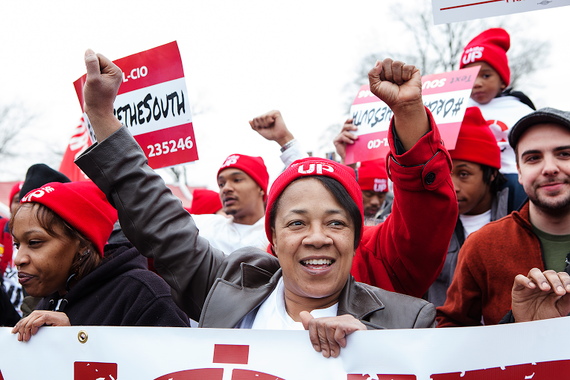 She was one of the first fast food workers in the South to walk off the job in 2013. This post is part of a series produced by The Huffington Post and The Hammer & Chisel Awards, in conjunction with the upcoming release of Michael Moore's new movie Where To Invade Next in order to honor "individuals who have, in their own unique and courageous way, made America a better place for all." Where To Invade Next opens nationally on February 12th.